Robb cresting one of the many knolls in the fog. A good view of what's to come. 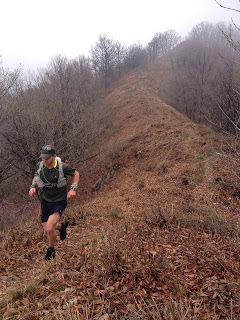 In 2011, Robb and I set off to backpack the Chuncheon circuit trail, about an 85km trot that covers every single mountain of note in the Chuncheon area. But a rough day two sent us home licking our wounds. The problem being that on this particular section of the Samak to Chuncheon Dam route, we had to traverse about 8km of a completely exposed spine. There is a section cut out about 20m across (you can see in the photos), and the brush and thorny bushes, heavily aided by the monsoons of mid-summer, had grown ferociously tall, razor sharp, and so thick that you could not see your feet, but knew they were there because they were attached to the ankles and calves that were getting cut to shreds by sharp thorns. We navigated about 5km of this, up and down, up and down, until the string of profanities that flew out of my mouth was longer than the trail itself. We ended up coming off the mountain, cried in our beers, Robb lost a cell phone, and the trip ended. We ended up completing the rest of the sections as day hikes. Robb looking strong on the dragon's back. This un-slain dragon of a of trail has haunted me ever since, but for whatever reason, I was never able to get back out there and finish it until yesterday. Looking at the numbers, the dragon doesn't look so formidable: 22km according to my conservative Garmin numbers, or 26 on Robb's friendly android GPS, and 1500 meters of vertical gain. But memories of suffering can project their own shadows, and in this case those shadows hold a bit of truth. The day began with a beautiful early morning jog along a creek, through green ferns and oak trees with a smattering of waning cherry blossoms. One kilometer in, we veer away from the creek and start the climb, a straight shot up 500 meters, and we dug into a hiking pace. As we summited, we were totally hemmed in by fog, so no stellar views, but it lent a kind of cool, eerie tenor to the trail. Perhaps just as well, too; a clear view would reveal two giant twin peaks about 180 meters higher than where we stood that we needed to traverse. A short reprieve ensued before climbing the first of these twins, and as we summited I felt jubilant, still unaware that we would descend 180 meters only to climb it right back up again. In the first 7.5km, we'd already done half of our elevation gain for the day. Just beginning the descent after 11 kilometers. At this point, I felt pretty good, having done a good portion of the day's work early on (ha! foolish optimism). We hit the open spine that previously had brought so much misery, and thankfully, this early in the season, there are no biting thorn bushes waiting to cut us up. So we started the up and down, up and down that gives this section the appearance of a dragon's back as all one can see in the distance are these green undulations. This section makes for some fantastic running, and the views all around are pretty epic, except we were mostly still in the fog. 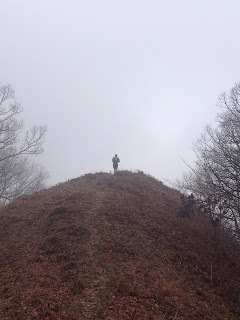 But on legs that had just climbed over 800 meters, these undulating mounds started to take their toll. By the time we reached the big descent at about 11km, my legs were feeling pretty trashed. But the sun began to burn away the fogs and clouds, and we could see the expanse of the valley and the rise of Samak-san in the distance-- truly stunning. After we dropped another 300 meters, we veered back into the forest, and started another fantastic running section of trail winding and rolling through a thick forest of birch trees and oaks. I was feeling pretty dreamy as an evil stump materialized out of the leaves and reached up to trip me, sending me in a horizontal catapult over the forest floor. Look ma, I'm flying! I got up after a couple of stunned moments, walked off a slightly tweaked ankle, and right as I got to running again I found myself at the bottom of another 100 meter climb. Perfect. At about 18km in, we crossed a fire road, and then began the last climbs of the day, a total of 200 meters, no easy task after three and a half hours and 1300 meters of vertical gain. At the foot of the final climb, I sat down and vacantly chewed down the remainder of a Clif bar, trying to summon the will to make the final ascent. Tagging far behind Robb at this point, I finally made it to the top, absolutely gutted. Looking at the clock, though, we decided to try and clear 4:30 for the day, and so Robb set off at a fast downhill pace, nimbly dancing off a rocks and roots and quickly cutting his way down the tiny switchback descents through the observing eyes of the birch trees. We passed a mountain temple, a sure sign that we were close, and hit the rocky, fast-dropping canyon path that became more and more cluttered with hikers. Navigating the rocks, roots, and hikers became quite a chore at high speeds, and my vision started to take on a sort of psychedelic glare, so I slowed down, deciding to forego a broken ankle for the day. 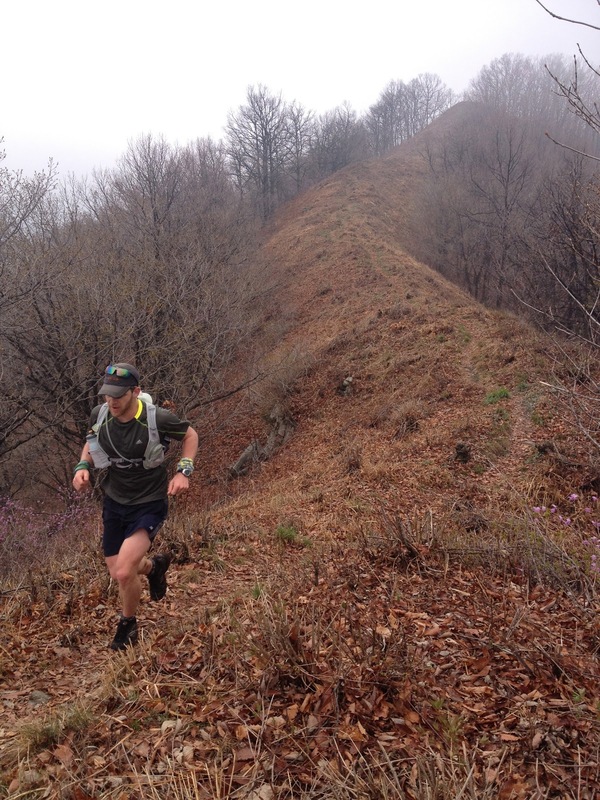 Robb burled on, flying down the path that wound through the rocks, over bridges and waterfalls, and dropping 200 meters in the final half kilometer. I finished at 4:37, Robb some minutes before, and our total moving time of the day was 4:07. At the end of the day, as I sat and stretched out my tender hip flexors and sore quads, we decided that we hadn't quite slain the dragon, but rather placated her just enough to gain permission to scale her heights and cross her long, rippling back. Rather than the dejection with which she sent us packing two summers previous, she had rewarded our fortitude and sent us away with a profound respect. Definitely the hardest 22km run I've ever done! Thanks Jon, yes, always approach dragons with a deep and hardy respect! And they are lurking in pretty much every mountain here on the peninsula.